The day I learned about Rahelle Ray, I never stop following her TV programs, her magazine, her website and her life! 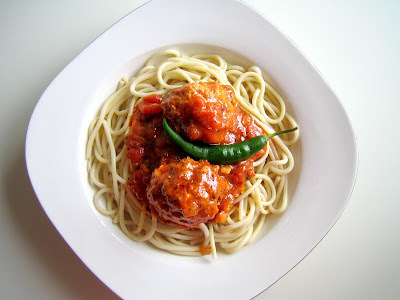 The good thing about her is that she shares every new recipe she concocts---same here with me, I want my reader to learn how to cook decent food. Here's my pasta meatballs photos stuffed with cheese and tomato and basil as sauce. Good enough to feed a hungry hippo. For the sauce, use the same procedure as the tomato and basil. For the meatballs, it's ground beef sirloin with all the spices you want plus flour and egg then stuff them with cheese. 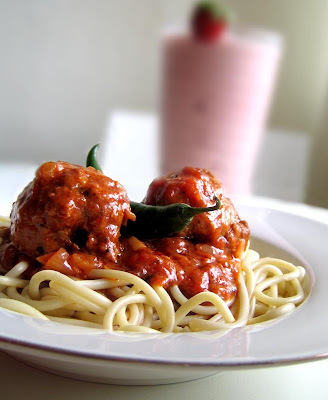 Best match for this pasta is a refreshing strawberry lassi milk shake. And for the incredible eater, if the pasta meatballs still not enough---a huge sandwich will complete your meal. 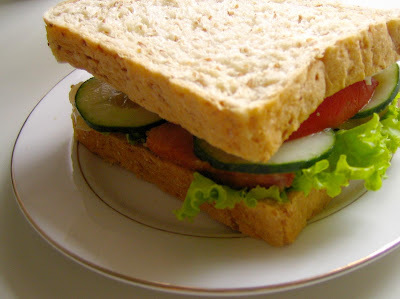 Introducing my Salami Sandwich, I used wheat bread plus loaded with lettuce, tomatoes, cucumber and my mayo dressing! Food Preparation, Food Styling and Photography by yours truly, The Artist Chef.